Sign up on our email list below for a chance to win 2 FREE tickets to the upcoming Brews Cruise and be in the loop on Brews Cruise News! Submit your name and email address below. Congratulations to Trini McCorkle, our WINNER of the free drawing for the October 12th Brews Cruise! You can still sign up for FREE tickets to our next Brews Cruise. But if you want to get on THIS one, you'll have to buy a ticket! Sell Tickets to Brews Cruise...Earn Beer Money! Join our sales affiliate program for free and we'll provide you with a unique website link that you can provide to all your friends, family, and colleagues. You can even use it as a fund-raiser for any organization you want! We'll pay you $10 commission for EVERY ticket sold through the affiliate link! Just think, you only have to get a few friends to buy tickets, and you'll earn enough to cruise for free! What can be better than FREE BEER?!?! Click on our little Beer Buddy to join and get your free affiliate link! 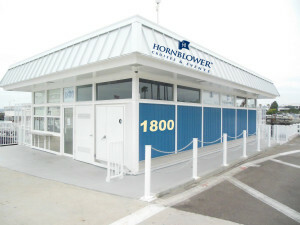 at the Hornblower Grape Street Pier. Exit Front St, go 3 blocks and turn right on Ash St. Turn Right on North Harbor Dr. Please make sure to give yourself plenty of time to find parking. 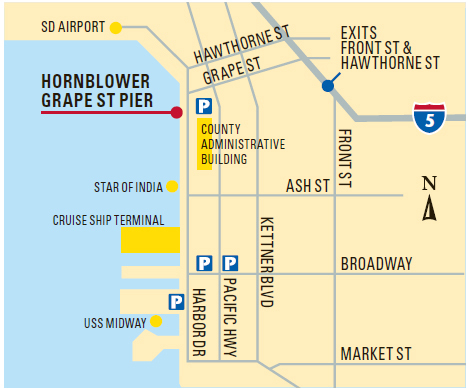 Hornblower or San Diego Brews Cruise does not operate the parking lots. Rates and hours are subject to change. metered parking available on North Harbor Dr. $1.25hour meters; 2 hours max on the east side of N. Harbor Dr. and 3 hours max on the south side of N. Harbor Dr.- free after 6 pm and on Sundays and Holidays. Additional Parking approximately 1/2 miles from check-in location—5 Star Public Parking— Corner of Pacific Highway and Broadway: 0 to 1 hour $5.00, 1 to 10 hours $10.00. Enter from Pacific Highway. 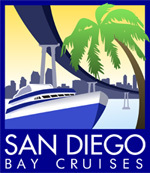 San Diego Brews Cruise recommends using public transportation, chartered party vans, or ride share programs to get you to and from the Brews Cruise events. Please do not drink and drive. We want you to come back to the next Brews Cruise!